provide estimated net price information to current and prospective students and their families based on a student’s individual circumstances. This calculator should allow students to calculate an estimated net price of attendance at an institution (defined as cost of attendance minus grant and scholarship aid) based on what similar students paid in a previous year. The net price is the estimated price students in similar situations have paid in the past. It is how much a student pays after grant aid is deducted from the total cost of attendance. It is not supposed to include any loans or work-study. This is not the same thing as the Expect Family Contribution, EFC. In fact, the schools are not required to even provide the EFC. This is why it’s a good idea to know your estimated EFC before you start using a school’s NPC. Essentially, a college’s NPC is supposed to tell families if and how it will meet families demonstrated need. Some schools, such as Trinity University, actually has users get their EFC from the College Board website and then enter it into Trinity’s NPC for a net price estimate. 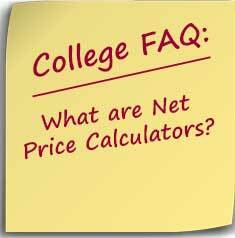 Not all net price calculators are equally reliable. Many schools use the federal template which asks only a minimal number of questions and is unlikely to provide users with higher incomes with a meaningful estimate. These are easy to spot. They usually have a blue background and if you enter you aren’t seeking any financial aid, the calculator simply stops and provides you with the total cost of attendance for the school. Other schools make it difficult to distinguish the net price as required by the government, no loans or work-study, from potential financial aid awards. The results from the UCLA NPC contains and “Estimated Award Letter” section listing “self help” and “family help” awards rather than work study and loans. This appears before the actual net price. Many schools incorporate merit aid into their net price calculators. These schools will ask for academic information such as test scores, GPA, and class rank and provide an estimated scholarship as well as the net price. One of the most important things to remember about NPCs is that the results are not guarantees–they are estimates only. However, if you do receive a financial aid award from a school that is significantly lower than what the NPC lead you to expect, it is perfectly acceptable to ask the financial aid office why the two numbers are so different.